Each year when November rolls around, writers everywhere begin to get silly and giggly and excited over the prospect of writing 50,000 words of nonsense. What am I referring to? National Novel Writing Month, of course! According to the NanoWriMo website, I’ve been participating for 13 years! Wow. Time flies! But I’m a little embarrassed to admit that I’ve never reached the goal word count. The inner critic comes out and I start second guessing every word I write. And yet, I haven’t given up. It takes practice to develop discipline. This year, I’m committed to working harder than ever to hit 50,000. I even created a writing schedule template to help me find the holes in my schedule. 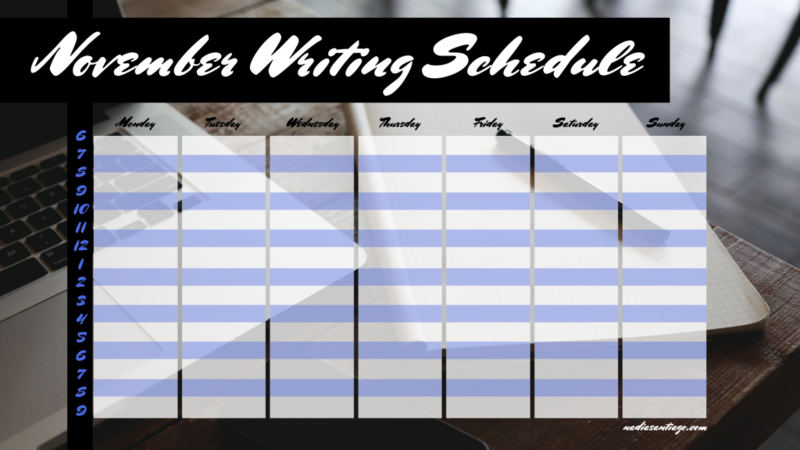 If you’re a nano writer like me, feel free to download it to use during the month, so you can reach the goal too! Good luck!